Writing the final volume of one’s memoirs is a very peculiar experience. This book does not chronicle the end of my life, as I am not yet dead; indeed, I am still hale enough that I hope to enjoy many years to come. It does not even chronicle the end of my career: I have done a great many things since the events described herein, and am rather proud of some of them. I suspect, however, that any sequelae would inevitably be a disappointment for the reader. Compared with what preceded it, my life in recent decades has been quite sedate. Harrowing experiences have been thin on the ground, the gossip about my personal life has long since grown stale, and although I am very proud of what I have learned about the digestive habits of the so-called “meteor dragon” of northern Otholé, that is not something I expect anyone but a dedicated dragon naturalist to find interesting. (And such individuals, of course, may read my scholarly publications to sate their thirst.) 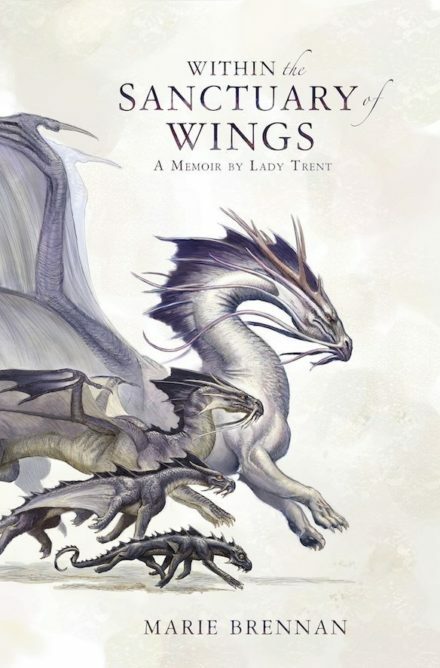 This book is not the conclusion of my tale, but it is the conclusion of a tale: the story of how my interest in dragons led me to the series of discoveries which have made me famous around the world. For you, my readers, who are already so familiar with the tale’s conclusion, the version of myself I have presented throughout these memoirs must seem terribly dense and slow of thought. Consider me akin to our ancestors who believed the sun revolved around the earth: I could only reason from the evidence before me, and that evidence was for many years incomplete. It was not until I had the final pieces that I could see the whole; and acquiring those final pieces required a good deal of effort (not to mention peril to life and limb). I have endeavoured here to recreate the world as it seemed to me at the time, without allowing it to be coloured overmuch by current knowledge. For the inevitable inaccuracies and omissions that has entailed, I apologize. But we must not rush ahead. Before we reach the end of my journey, there is more to be told: the scientific advances of the time; the various conflicts which came to be termed the Aerial War; and the fateful encounter which sent me into the dizzying heights of the Mrtyahaima Mountains. I hope my words may convey to you even a quarter of the sheer astonishment and wonder I experienced — and, perhaps, a fraction of the terror as well. After all, without both sides of that coin, you cannot truly know its worth. Members of the peerage, I need hardly tell you, are not always well-behaved. Upon my ascension to their ranks, I might have become dissolute, gambling away my wealth in ways ranging from the respectable to quite otherwise. I might have ensconced myself in the social world of the aristocracy, filling my days with visits to the parlours of other ladies and the gossip of fashion and scandal. I might, were I a man, have involved myself in politics, attempting to carve out a place in the entourage of some more influential fellow. “God willing.” He laid a kiss on my forehead and stepped back. In a Scirling frock coat or an Akhian caftan, my husband cut a fine figure — especially at moments like these, when his thoughts were bent to matters academic. Some ladies’ hearts are captured by skill at dancing, others by poetry or extravagant gifts; it will surprise no one that I was taken in by his keen mind. I meant the phrase as a euphemism. Necessity had taught me to be a hostess in the usual sense, though I still vastly preferred a meeting of the Flying University to a formal dinner. A baroness does have certain obligations, however, and although in my youth I would have thrown them off as useless constraints, in my maturity I had come to see the value they held. All the same, my true purpose in circulating about the hall and the lobby was to take a census of men I expected to cause trouble. I made particular note of a certain magister, whose name I shall not disclose here. If his past behaviour was any guide, he would find something to argue about even if Suhail’s lecture concerned nothing more substantive than the weather — and my husband would be giving him a good deal more fodder than that. Following a short introduction by the president of the grandly-named Association for the Advancement of Understanding of the Draconean Language, Suhail took the stage, to a generous measure of applause. Our discovery of the Watchers’ Heart (not to mention our romanticized wedding) had made him famous; his scholarly work since then had made him respected. It was not interest in Draconeans alone that brought such a large audience to Caffrey Hall that afternoon. Having a sense of Draconean pronunciation, however, does not get us much further. What use is it to have confidence that a given symbol sounds like “ka” when I do not know what any of the words containing “ka” mean? In order to progress further, linguists must try a different tactic. But the argument at the door had nothing to do with Suhail’s lecture. From my seat, I had been unable to see the man at the center of the knot; now that I drew near, I caught a glimpse between the shoulders of the other men. He dressed in the manner of a northern Anthiopean and had his hair trimmed short, but a suit did nothing to change his features. The man was Yelangese. Furthermore, readers of my memoirs know that I had quarreled with the Yelangese on multiple occasions: when I was deported from Va Hing, when I stole one of their caeligers in the Keongan Islands, and when they made organized efforts to sabotage our work at Dar al-Tannaneen. This was public knowledge at the time, too — which meant that the gentlemen near the door, seeing a Yelangese man show up at my husband’s lecture, had leapt to some very hostile conclusions. “Nor does it mean it’s false,” I said. In truth, though, I suspected there was indeed more to the story. The Yelangese stranger, though doing his best to keep a bland expression, had clearly recognized me. Which was all well and good — as I have said, I was very recognizable — but something in his manner made me suspect I was his reason for coming to Caffrey Hall that day. My heart stuttered in its beat. Perhaps you think it was a foolish reaction; I will not argue with you. But I had been on the receiving end of Yelangese trying to kill me, and could not forget that so easily. Had Thu Phim-lat been a long-time resident of Falchester, I might have persuaded myself that he was no threat. But if he had just arrived . . .
His eyes darted from side to side, taking in the men watching us. They had arrayed themselves quite close, clearly ready to interpose their bodies if Mr. Thu made a single move toward me. “Oh, come now,” I said impatiently — as much to myself as to them. I did not like feeling afraid in my home city, and I liked even less feeling afraid when I had so little cause. “If he wished me any harm, there are far easier ways for him to achieve it than by walking into a public lecture hall.” He could have accosted me on the street, appearing out of the crowd before I even knew he was there. A cosh to the back of the head, a knife between the ribs . . . but that was foolishness. Yelang had only troubled me when I troubled them, by investigating dragons in their country or attempting to breed my own for the Royal Army. There was no reason for them to assassinate me at home, unless I had made a much more personal enemy than I knew. And doing so would only make them look dreadful in the court of public opinion.